丹田和宏 作品展 - MY FAVO.. 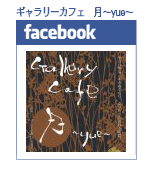 Copyright © 2012-2015 Gallery Cafe 月～Yue～. All Rights Reserved.